What if Canada was only 100 people? Who would they be? What would they be like? 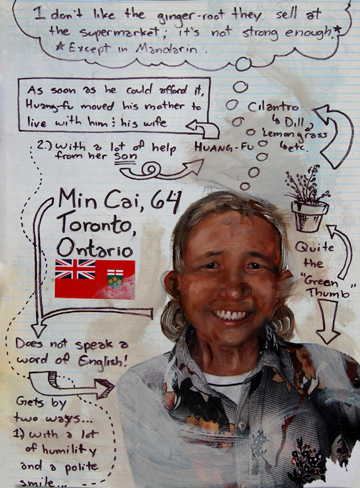 Where and how would they live? 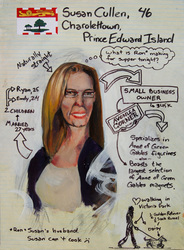 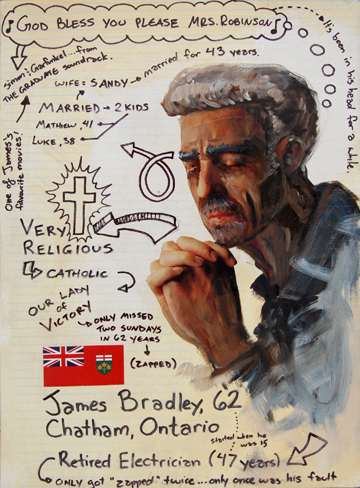 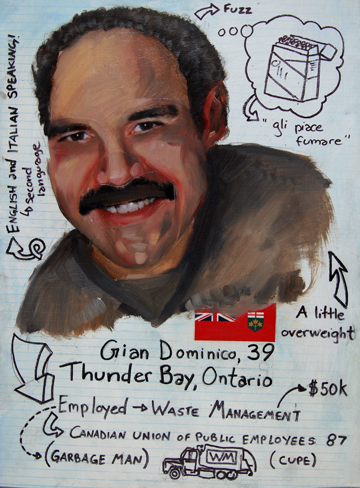 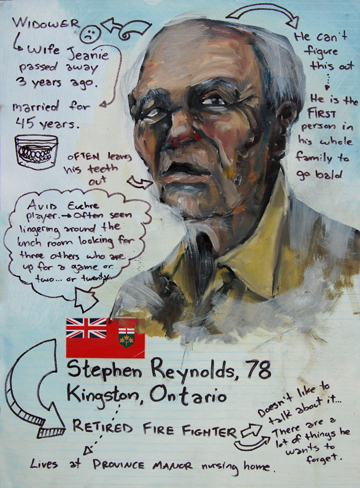 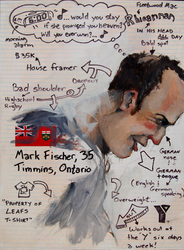 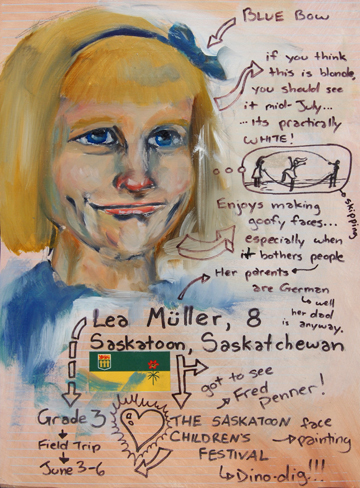 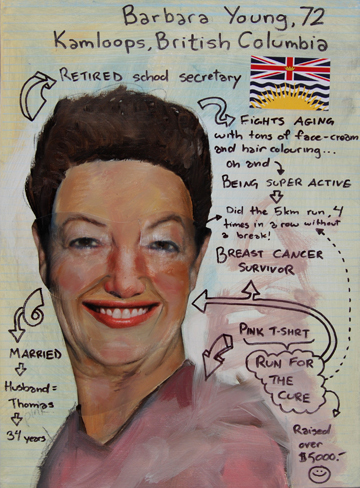 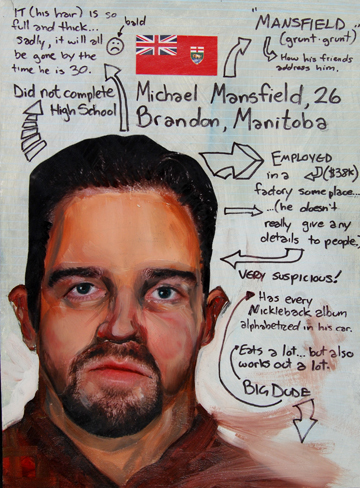 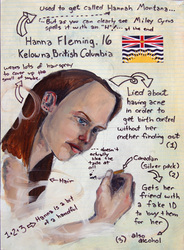 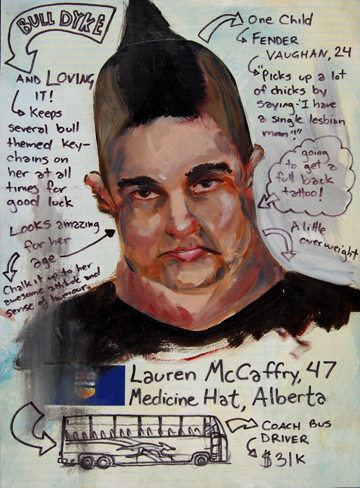 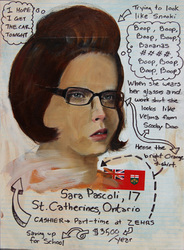 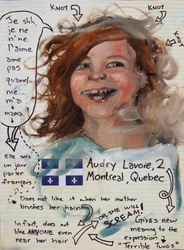 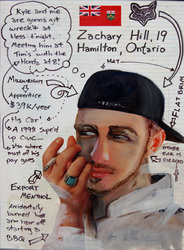 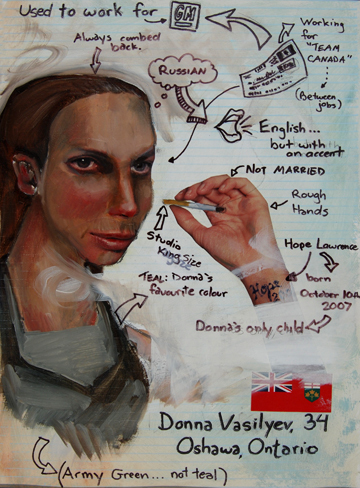 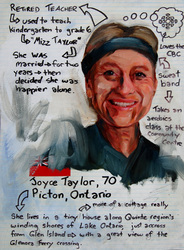 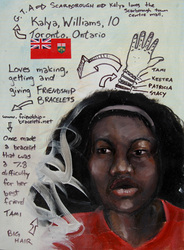 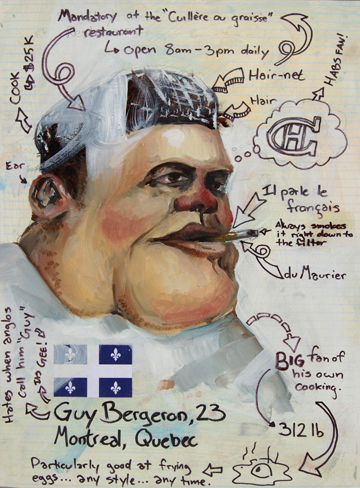 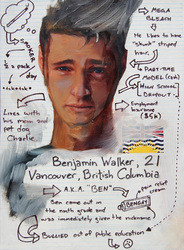 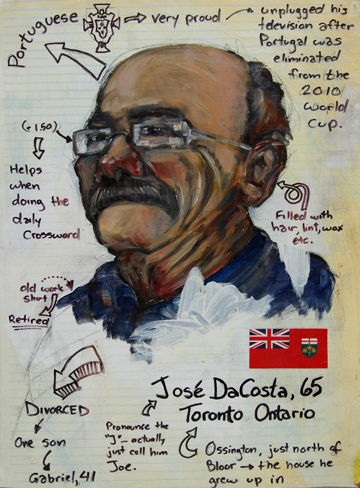 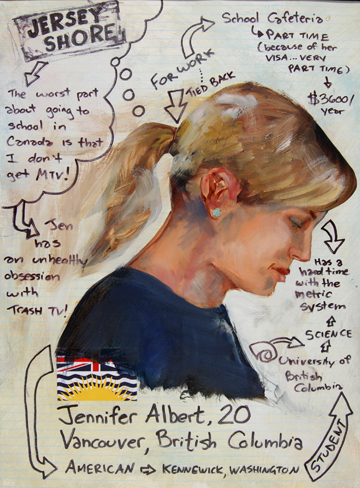 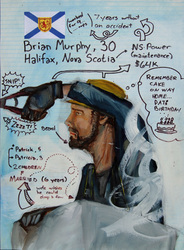 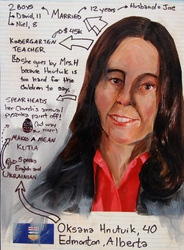 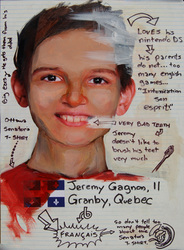 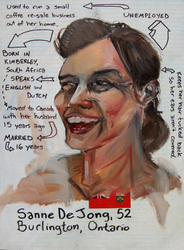 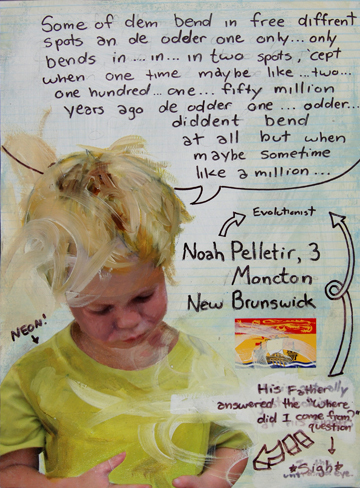 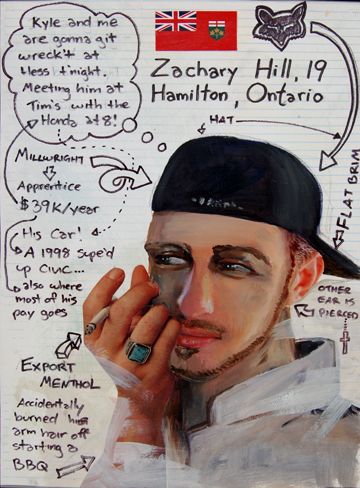 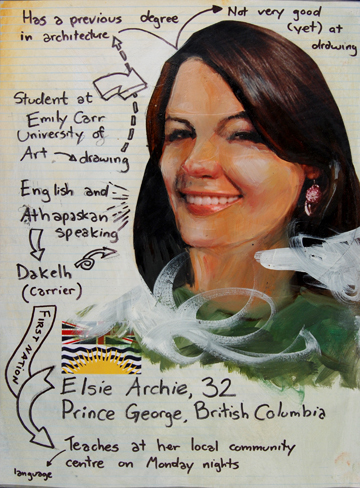 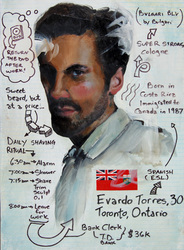 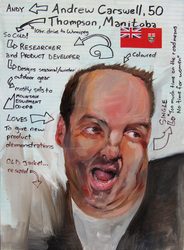 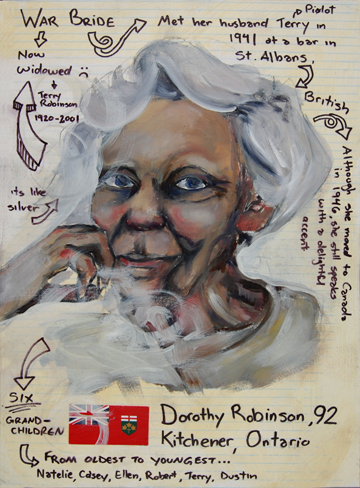 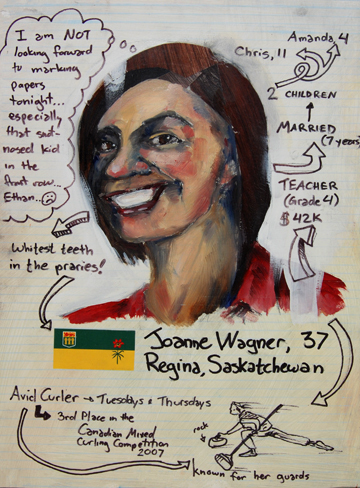 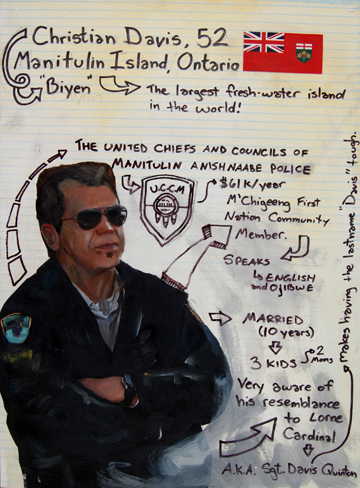 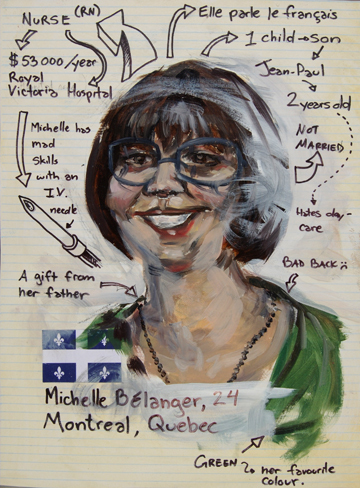 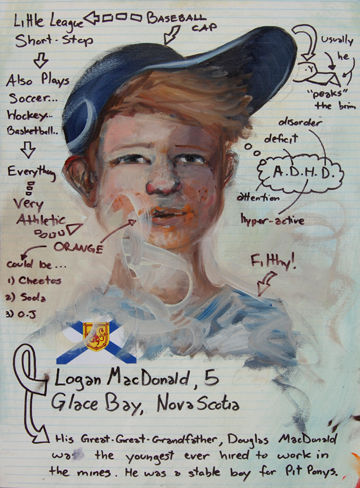 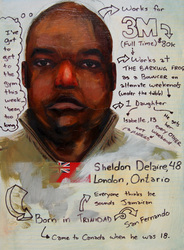 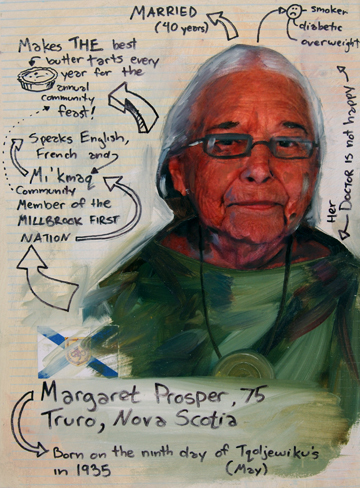 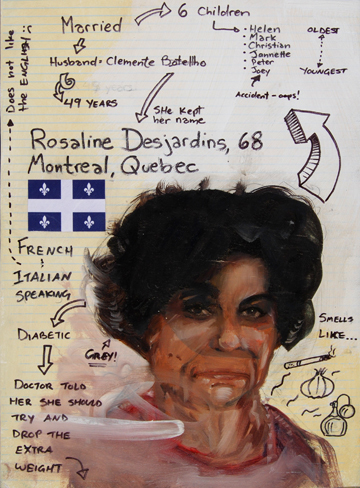 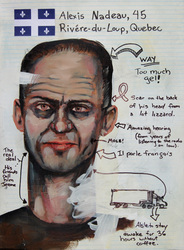 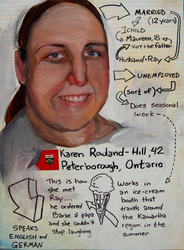 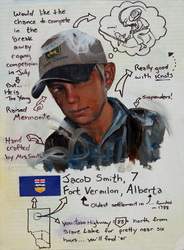 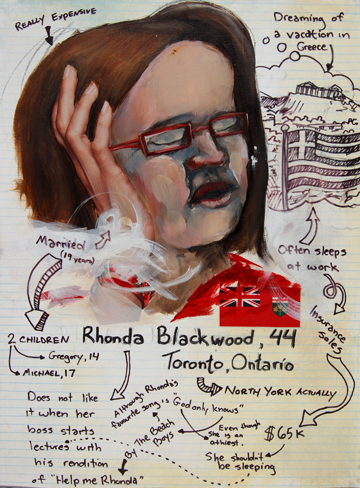 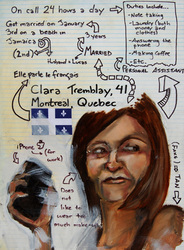 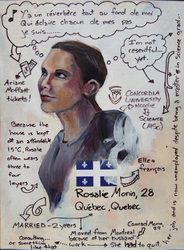 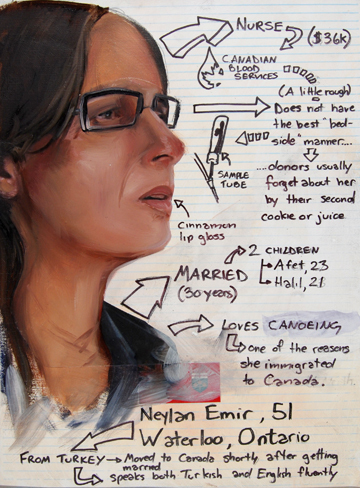 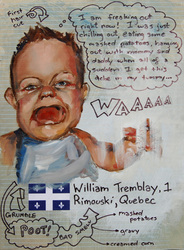 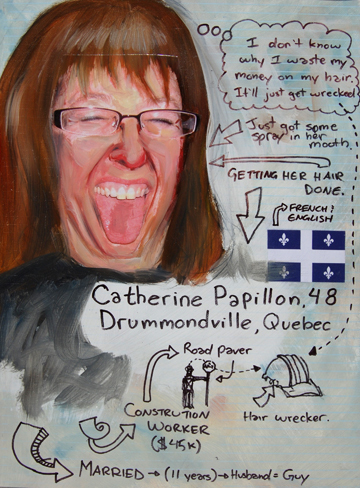 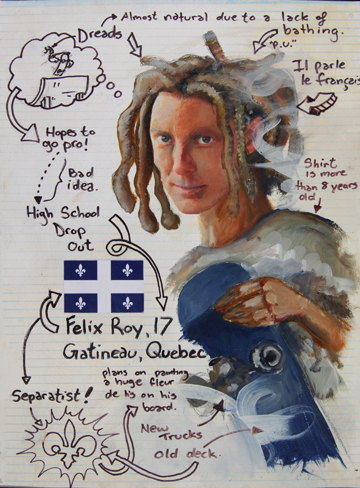 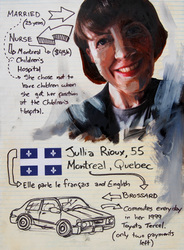 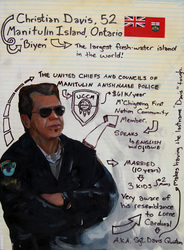 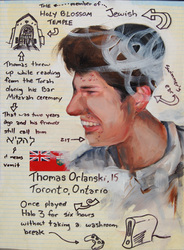 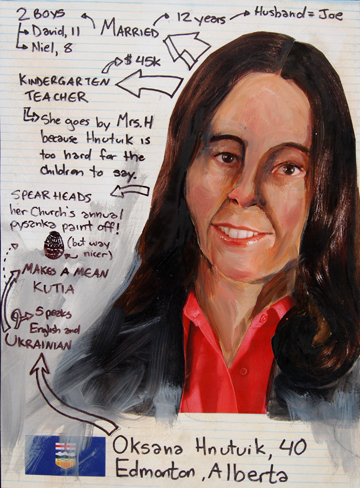 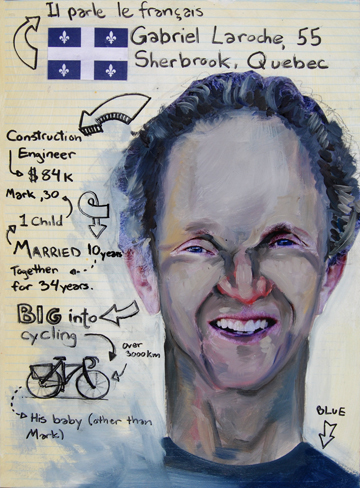 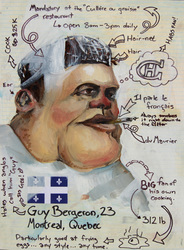 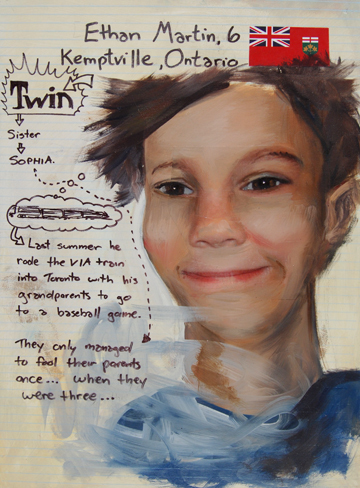 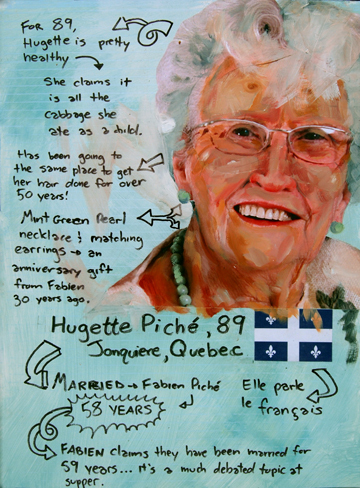 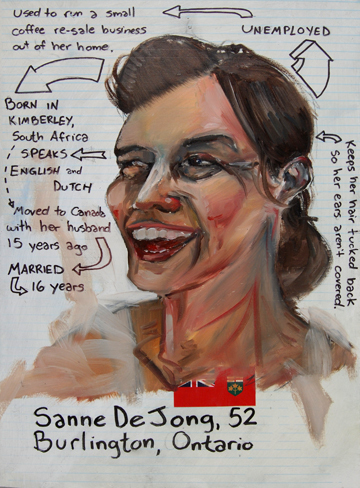 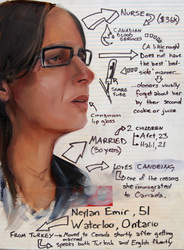 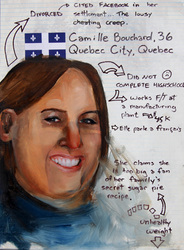 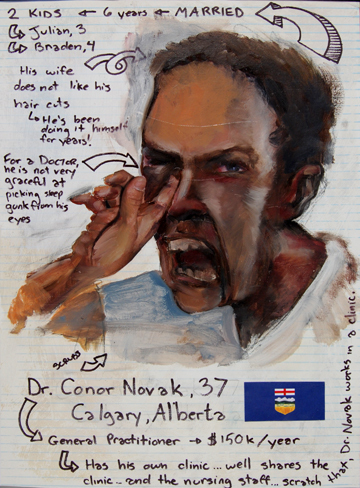 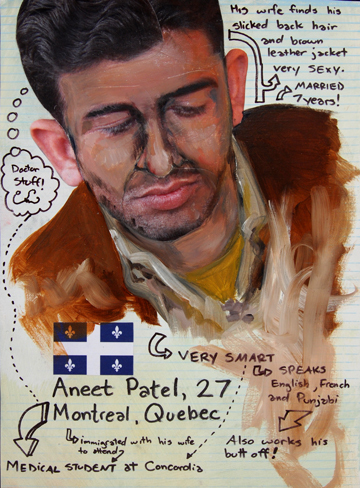 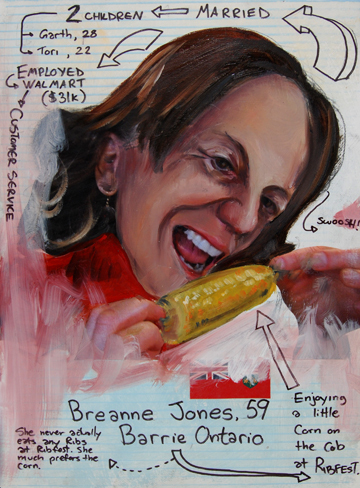 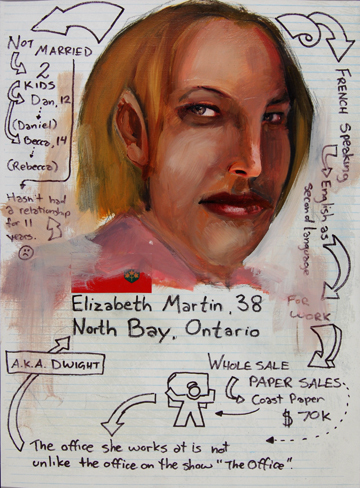 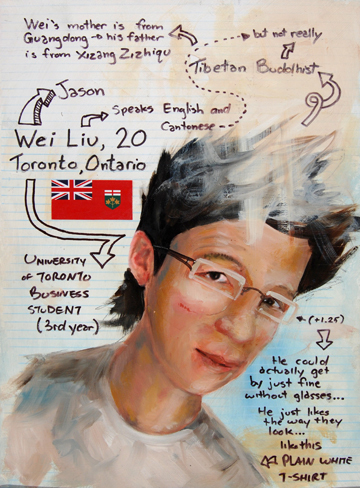 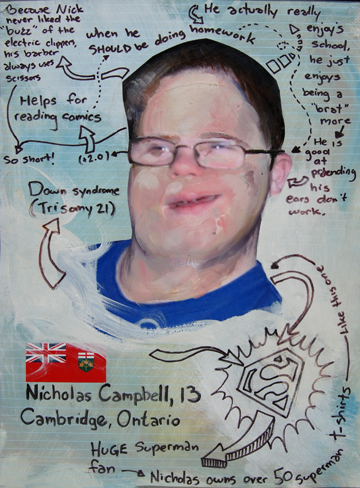 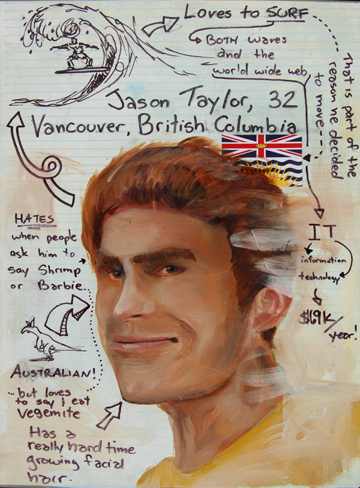 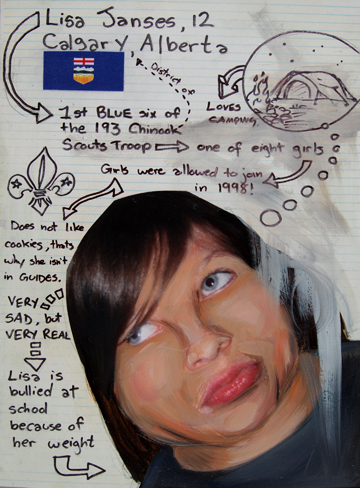 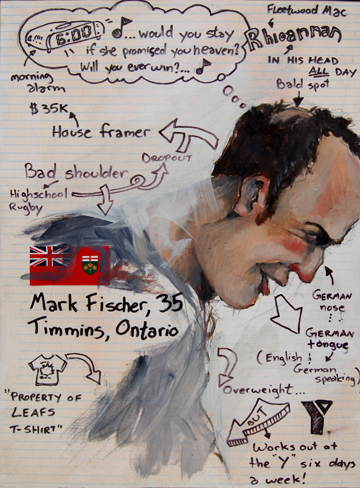 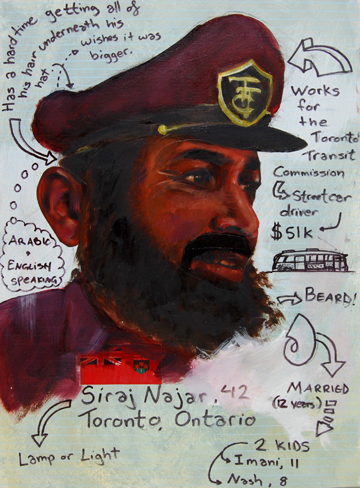 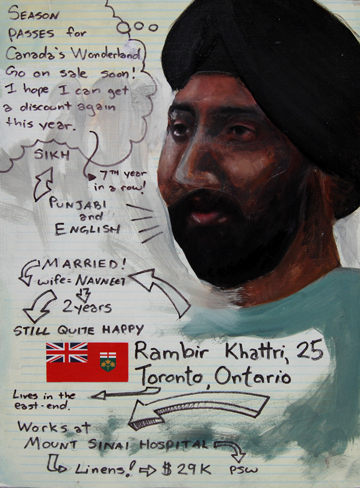 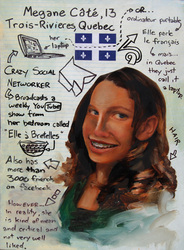 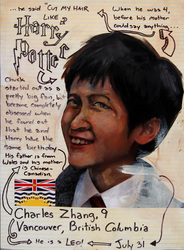 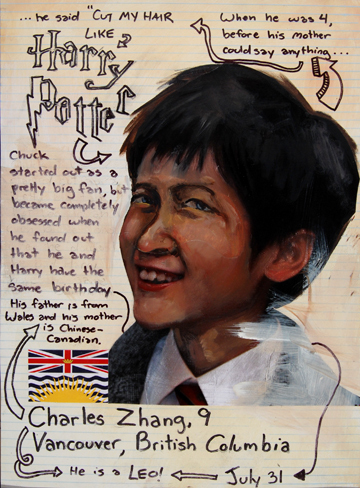 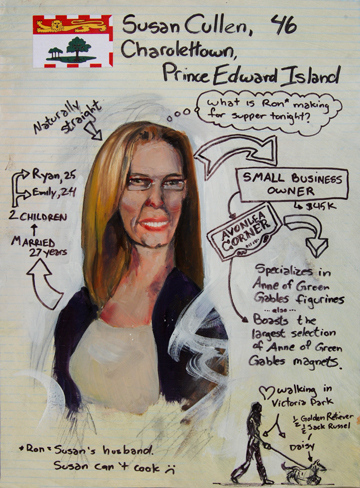 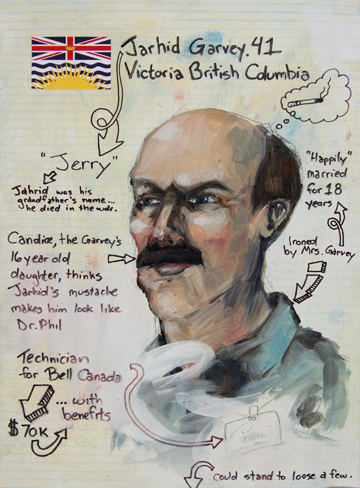 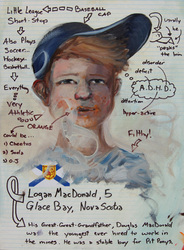 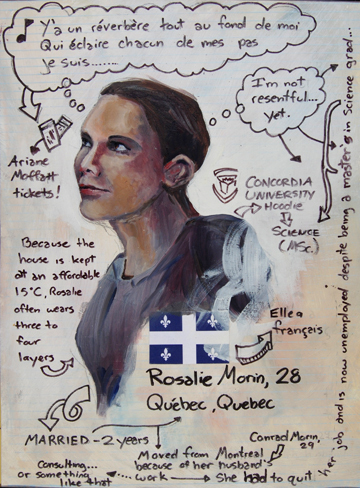 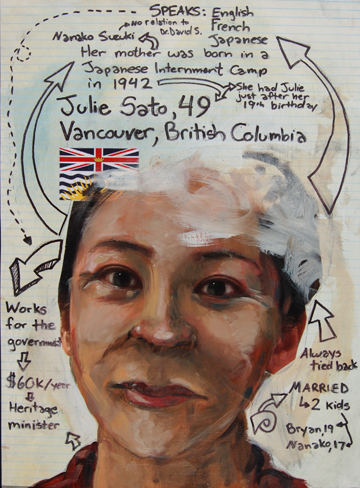 "One Hundred Canadians" is a series of one hundred stylized portraits of semi-fictional individuals based on Canadian national population statistics. 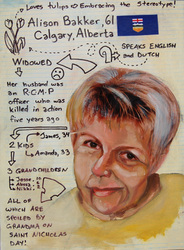 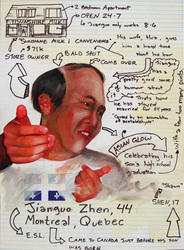 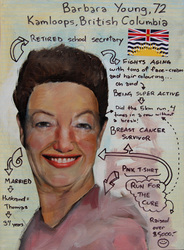 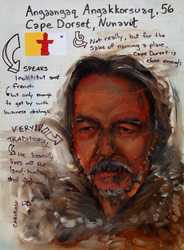 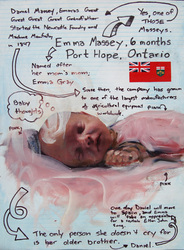 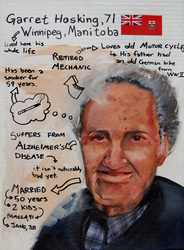 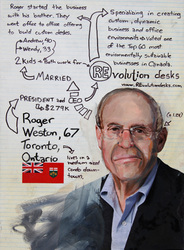 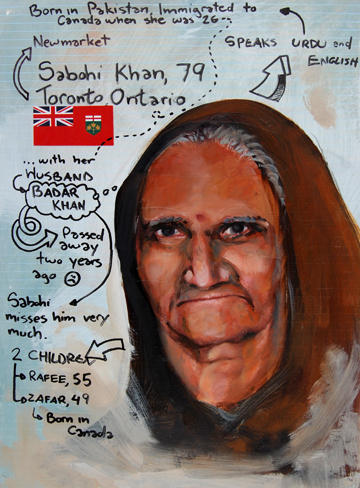 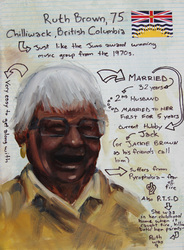 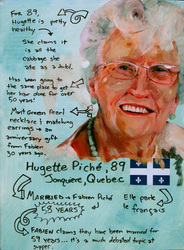 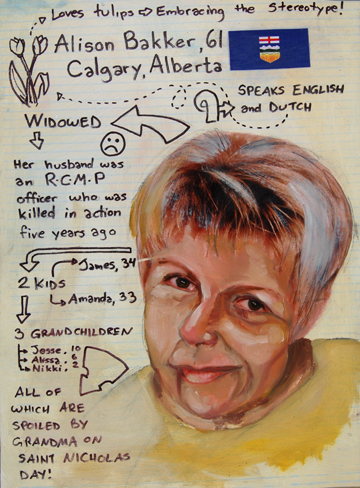 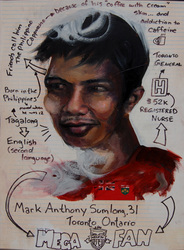 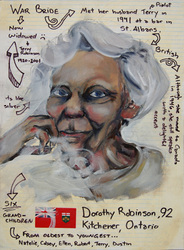 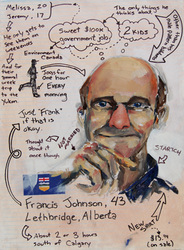 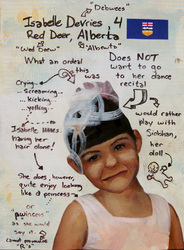 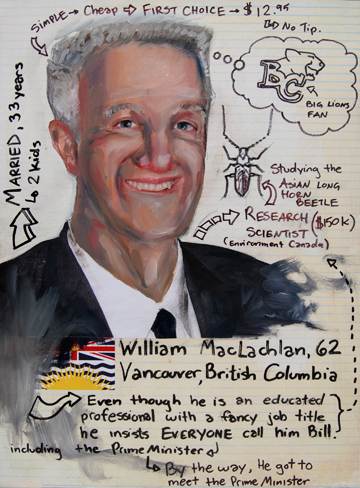 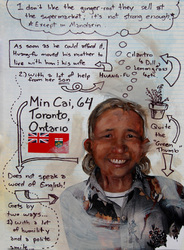 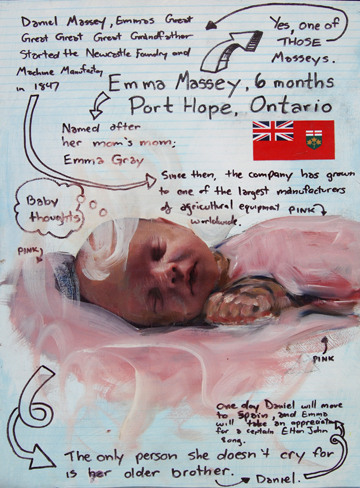 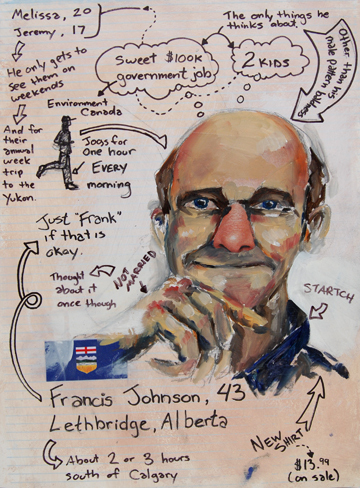 Using statistics taken from Statistics Canada’s 2010 database I extracted as much information as I deemed appropriate to inform a series of portraits based on the population as a percentage. 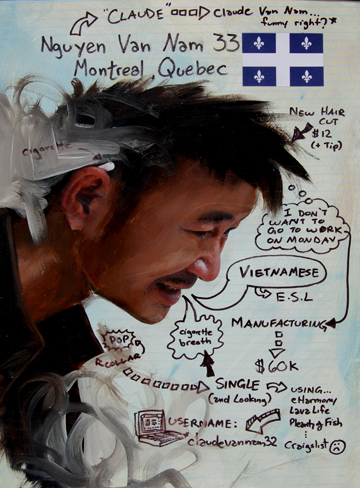 Such information included: gender, age, ethnicity, birthplace, immigration status, population density, overall health, religion, marital status, occupation and average annual income. 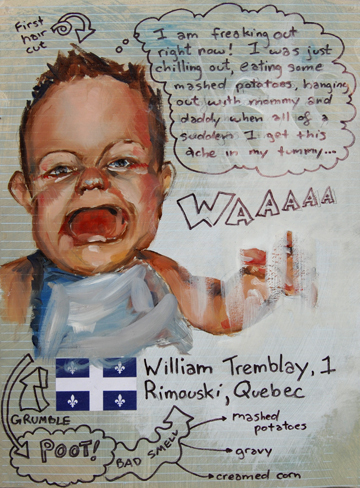 After rationing the information into a database of 100 people, I researched popular family names by place of birth and popular baby names by year of birth. 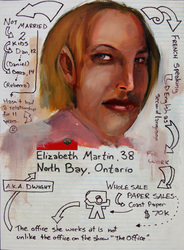 From this list I was able to formulate the series of fiction people informed by factual information. 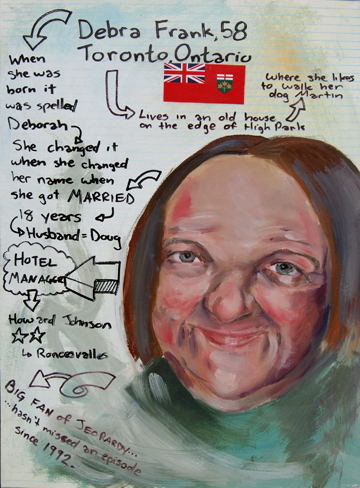 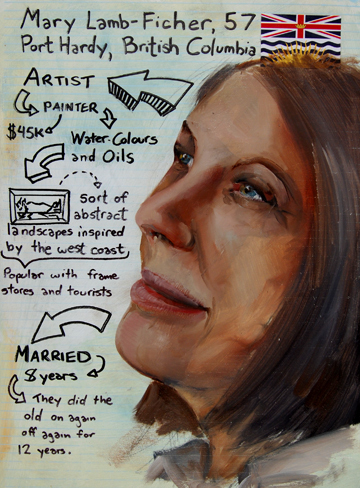 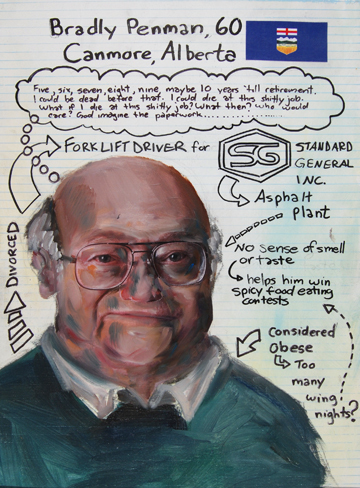 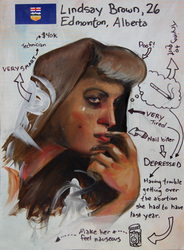 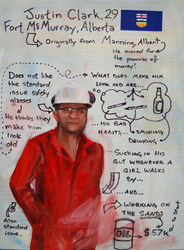 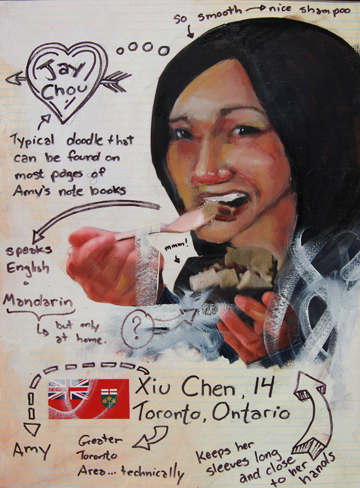 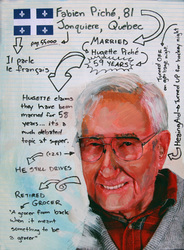 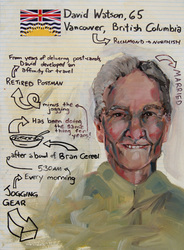 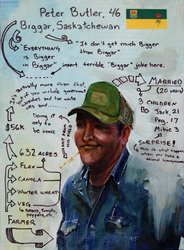 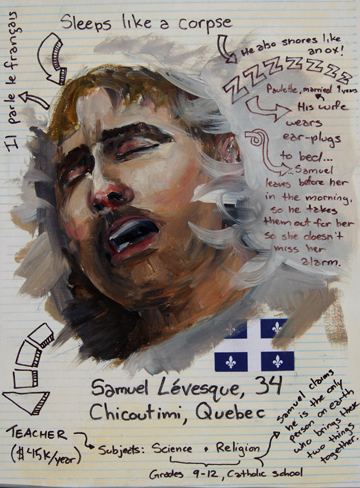 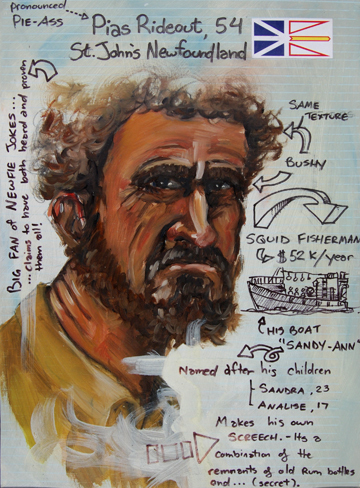 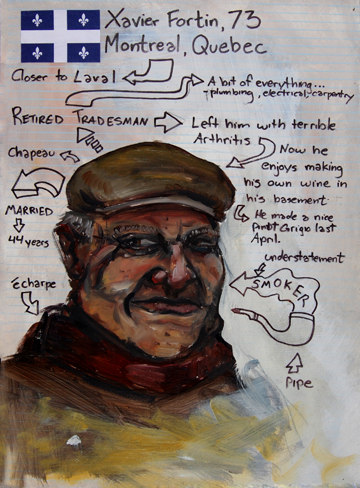 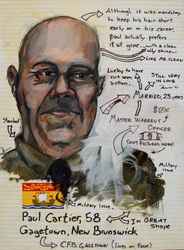 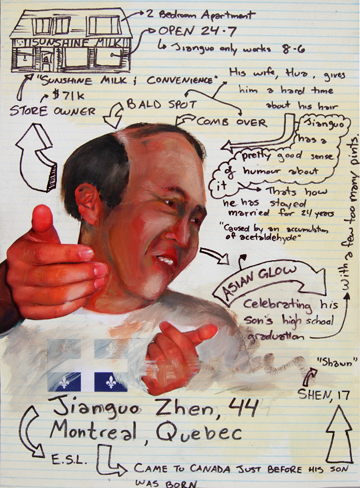 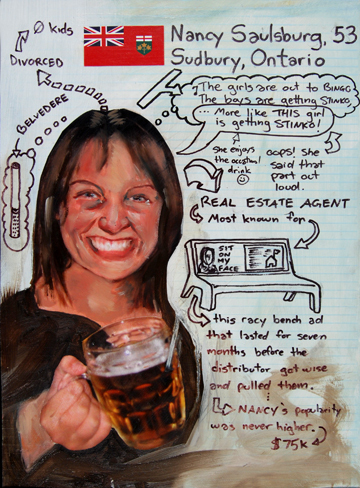 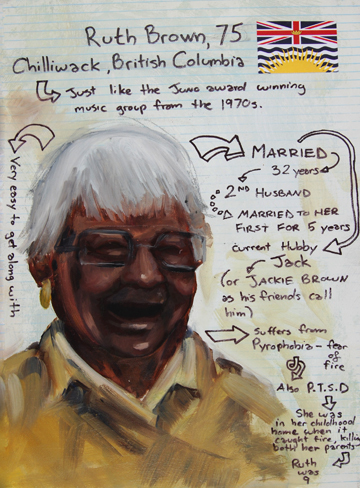 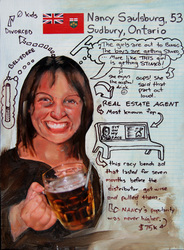 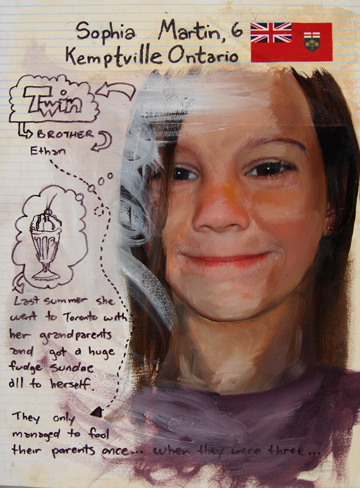 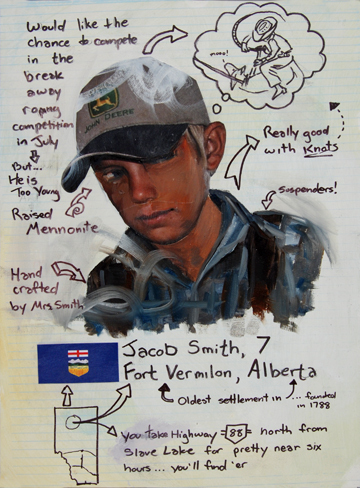 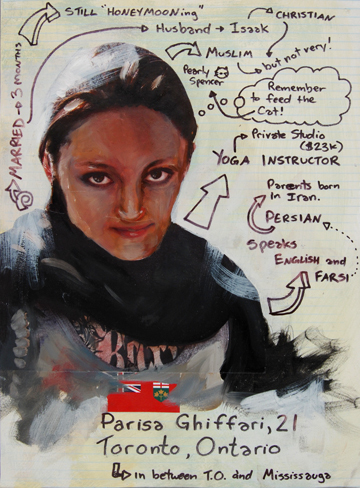 In an effort to separate the person portrayed in the portrait from the statistics they are inspired from I imbued each portrait with fictional anecdotes to help form a more intimate identity and take them one step further from fiction. In the end, my hope is that the series conjures feelings of familiarity and opens the audience up to question their identity in relation to Canada.